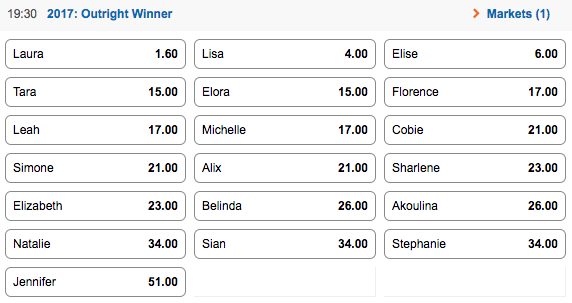 The fight for the love of Matty J has heated up and with it the betting in the 2017 series of The Bachelor Australia. We are only two episodes into season four of the hit Australian show but already some strong favourites have emerged from the pack with fans and with the betting agencies. 30-year-old accessories designer Laura has distanced herself from the pack after two episodes, coming into as little as $1.60 with the likes of Sportsbet and William Hill. Laura is yet to receive a 1-on-1 date with Matty J, but from the episode three previews she looks likely to get the chance soon. Interestingly, Laura is a spitting image of the girl that broke Matty J’s heart in The Bachelorette last year, Georgia Love. “Laura certainly made an impression on Matty and an even bigger one with our punters as they reckon the similarities with Georgia are just too much to ignore,’’ said Sportsbet’s Will Byrne. Victorian model Lisa sprinted out of the blocks after being the first girl asked to the ‘secret garden’ in episode one and is still a strong favourite after being taken on a 1-on-1 tennis date in the second episode. On the other side of the coin, dynamic duo Leah and Jennifer have set themselves up to be the main antagonists of the season and likely have very little chance of making a deep run in the show. Many of the girls haven’t even been featured after the editing so there could be plenty of twists and turns to come once we get to know more of the girls. Now could be a great chance to jump on some of the lesser known girls at better prices. Our pick, however, is the blonde bombshell Lisa.